Proprietary Name: Lebody Lab Renewal Dual Effect Peptide Serum What is the Proprietary Name? 71080 - Gtg Wellness Co., Ltd.
Lebody Lab Renewal Dual Effect Peptide Serum with NDC 71080-0009 is a a human over the counter drug product labeled by Gtg Wellness Co., Ltd.. The generic name of Lebody Lab Renewal Dual Effect Peptide Serum is niacinamide, adenosine. The product's dosage form is liquid and is administered via topical form. Labeler Name: Gtg Wellness Co., Ltd. Cautions:1. In case of using cosmetics or after use, please consult a specialist if there is any abnormal symptom or side effect such as red spot, swelling or itching in direct sunlight.2. Do not use on wounded areas.3. Precautions for storage and handlinga) Keep out of reach of children.b) Avoid direct sunlight. Uses:■ It makes improvement in skin tone evenness and level of brightness. 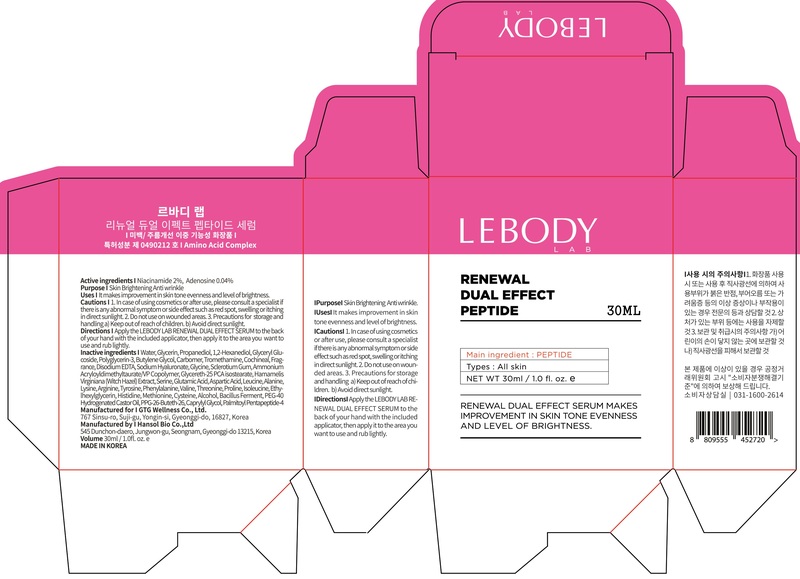 Directions:Apply the LEBODY LAB RENEWAL DUAL EFFECT PEPTIDE SERUM to the back of your hand with the included applicator, then apply it to the area you want to use and rub lightly.